← Back from the Low Carb Meet-and-Greet! I’ve been neglecting the blog, and it hasn’t been because of a lack of things to write. My “day job” has suddenly gotten more… well, interesting. I’ll just leave it at that. 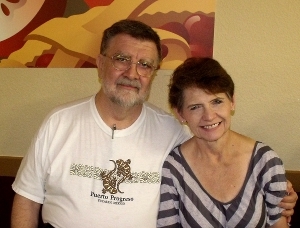 Last month, Georgene and I had the opportunity to visit some of the folks we met on the two low-carb cruises. It was about a 4-hour party held at the residence of Dana and Eric in Indiana. I still find it interesting that we were willing to drive 14 hours each way to attend a 4-hour party, but such is the bond between members of this particular affinity group. In this case, people who have discovered that the dietary advice given out by the mainstream medical community just doesn’t work, and who are busy comparing notes on what does. Georgene complained that the trip wore her out, but she was still glad we did it. And if circumstances allow, we may do it again next summer. Only we will probably fly next time, since neither of us really likes driving all that much. 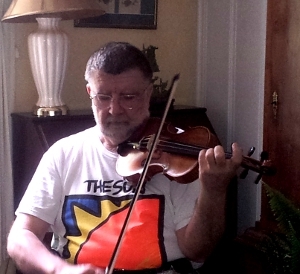 I took my good fiddle with me, and I spent about a half-hour playing Celtic music, and nobody complained! Georgene managed to get this snapshot of me “fiddling around” in the living room. The colorful T-shirt is one that I got Cozumel. Judging from my contemplative look in the photo, this must have been taken while I was playing a slow air. Since the last LC cruise, Georgene and I have been to two other “meat ups” in addition to the one in Indiana. Scott Merrit did the organizational work for a group that he dubbed The Friends of Bob A, and we met at Brazillian Cowboy back in June. 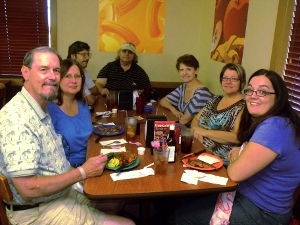 Last night, we convened for the second meeting, this time at the Golden Corral in The Colony (a northern ‘burb of Dallas). Scott organized this one, as well. It was nice getting together to discuss our progress — and we had a new “member” who was a friend of Scott’s, who wanted to come and see what this “meat up” (and low-carb eating) was all about. It got off to a less-than-great start when we arrived and found that the air conditioning in the meeting room we were going to use had failed, and the seating in the cool end of the restaurant was a bit crowded. Georgene and I managed to get a couple of tables in the far corner, which we carefully guarded until the rest of the gang arrived. I got a fairly good photo of the group this time (the lighting wasn’t quite as awkward as it was at the June meeting). Of course, since I was taking the picture, I wasn’t in it. So Robert (Scott’s friend) graciously offered to take a photo of me with my arm around Georgene. Afterwards, we met out by Scott’s van to get some pastured eggs that Scott brought from his farm, and discussed where we would have the next meeting of the Friends of Bob A. One of the group members volunteered to have it at her house, and make it a pot-luck event. That was met with unanimous approval of the group, since the advantages were pretty obvious. The Brazilian steakhouse was pretty good, but pricey. Golden Corral was less expensive, but only marginally acceptable (if you are careful, you can get a suitably low-carb meal there). On the other hand, a pot-luck among a group of people who are seriously into the low-carb way of life has the potential to be much better than any restaurant. 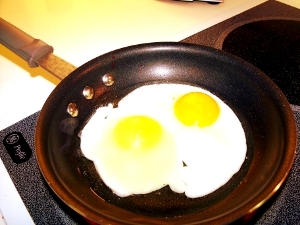 Speaking of better than any restaurant, I took a photo of one of Scott’s eggs up next to one we got from the local grocery store. The picture doesn’t really show it very well, but there is a striking difference in the color. The one on the right is much more orange, in addition to sticking up higher just because it is fresher. Probably by several days. I think that the consensus of our group is that we will take turns hosting the Friends of Bob A meetings on a more-or-less monthly basis. Georgene already volunteered our house for sometime in the Fall, and Scott mentioned that in late Fall or early Winter, we might be able to meet at his farm (I’m looking forward to that!). This entry was posted in Diet, Health, Low Carb Fun, Meat-ups!. Bookmark the permalink.